In the homey dining room at West Oakland’s Brown Sugar Kitchen, servers glide between tables offering refills on coffee while line cooks work in the open kitchen, frying chicken in front of a row of countertop seats. 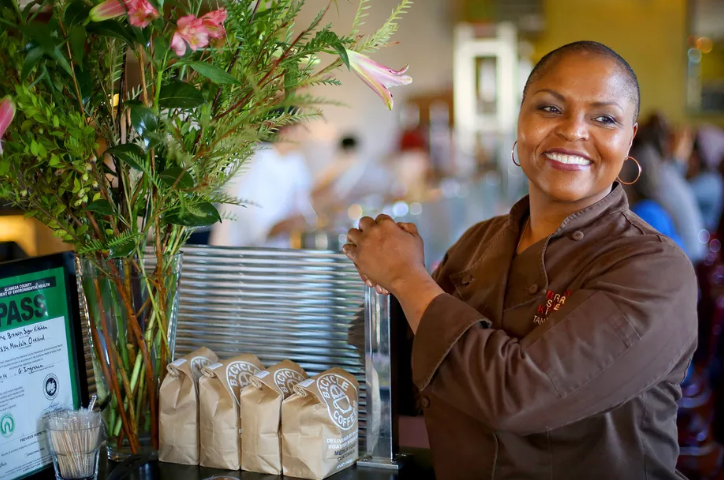 A neighborhood favorite, the restaurant boasts a warm atmosphere combining owner and chef Tanya Holland’s French culinary training with traditional down-home soul food to create dishes like barbecue shrimp and grits, beignets, and buttermilk fried chicken served with a cornmeal waffle. Though nothing in Brown Sugar Kitchen’s dining room or menu shows off the restaurant’s environmental credentials, Holland has long used sustainable practices, including ordering from local vendors and composting. Now she is pursuing a new, even more ambitious goal: a zero-waste kitchen. Alongside chef Tim Ma (of Kyirisan in Washington, D.C.) and chef Jehangir Mehta (of Graffiti Earth in New York), Holland spent two months tracking her food waste and identifying different actions — from composting to team culture, products, and sourcing — that can reduce her restaurant’s environmental footprint. Zero waste efforts address a serious issue that affects both commercial and home cooks: Some 50 percent of all produce in the United States ends up in the trash can. Not only does the lost sustenance fill up landfills, accounting for 20 percent of our annual municipal landfill content, it also costs a family of four an average of $1,500 each year. “We did not anticipate or design for this,” Zvereff explained. Still, the startup has leaned into the project. In addition to repeating the Zero Waste Kitchen project with more chefs in more cities, they’re also planning to create a forum on their app for discussing zero-waste techniques, and have added features to the app to encourage buyers to purchase items that are often overlooked — other chefs mention unusual grains like amaranth and rye or cheese whey as examples — reducing waste at the supplier level. As Brown Sugar Kitchen’s Holland notes, for busy chefs looking to get involved in policy or political conversations outside the kitchen, food waste is an easy sell. Most restaurants are already laser-focused on processing food as efficiently as possible since lost food equals lost revenue. A formal zero-waste commitment is a simple step to take, aligning the kitchen and staff around a common goal. The restaurant’s small kitchen and limited storage ability — it has no walk-in refrigerators or freezers — also mean that the lean, precise ordering Blue Cart promotes is already integral to the operation. With little room for extra food, every item must be ordered with care, and it’s hard for items to get lost or spoil in the back.